Will the iconic mammoth, which went extinct about 10,000 years ago, may once again walk the Earth. If a team of researchers succeeds, they will. The team has established a technique to extract DNA from frozen cells. and will attempt to resurrect the species using cloning technologies after obtaining tissue this summer from the carcass of a mammoth preserved in a Russian mammoth research laboratory. It . Under the leadership of Akira Iritani, professor emeritus of Kyoto University, the nuclei of mammoth cells will be inserted into an elephant's egg cells from which the nuclei have been removed to create an embryo containing mammoth genes. The embryo will then be inserted into an elephant's womb in the hope that the animal will give birth to a baby mammoth. Researchers from Kinki University's Graduate School of Biology-Oriented Science and Technology began the study in 1997. On three occasions, the team obtained mammoth skin and muscle tissue excavated in good condition from the permafrost in Siberia. However, most nuclei in the cells were damaged by ice crystals and were unusable. The plan to clone a mammoth was abandoned. In 2008, Dr. Teruhiko Wakayama of Kobe's Riken Center for Developmental Biology succeeded in cloning a mouse from the cells of mouse that had been kept in deep-freeze for 16 years. The achievement was the first in the world. Based on Wakayama's techniques, Iritani's team devised a technique to extract the nuclei of eggs–only 2 percent to 3 percent are in good condition–without damaging them. Last spring, the team invited Minoru Miyashita, a professor of Kinki University who was once head of Osaka's Tennoji Zoo, to participate in the project. Miyashita asked zoos across the nation to donate elephant egg cells when their female elephants died. If a cloned mammoth embryo can be created, Miyashita and U.S. researchers, who are experts in animal in vitro fertilization, will be responsible for transplanting the embryo into an African elephant. The team said if everything goes as planned, a mammoth will be born in five to six years. "If a cloned embryo can be created, we need to discuss, before transplanting it into the womb, how to breed [the mammoth] and whether to display it to the public," Iritani said. "After the mammoth is born, we'll examine its ecology and genes to study why the species became extinct and other factors." Elsewhere, several scientists across the globe are taking cloning to a whole new level. In an earlier Daily Galaxy post "Neanderthal Man, the Sequel -Scientists Aim to Bring Extinct Species Back to Life," we discussed how paleontologists are piecing together the complete genomes of long-dead species, such as the woolly mammoth and the Neanderthals, in an effort to bring them back to life. 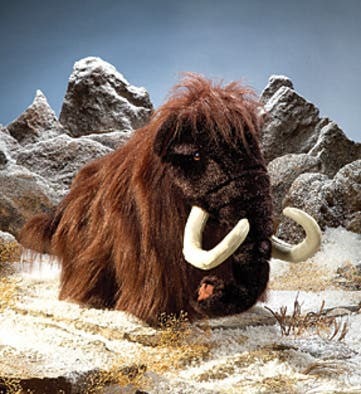 Eske Willerslev of the University of Copenhagen in Denmark who is working on reconstructing the mammoth, says he believes it is possible to bring back an extinct species like a mammoth if an extremely well preserved cell is found. He May have gotten his wish. A beautifully persevered baby mammoth was found. "The mammoth has no defects except that its tail was bit off," said Alexei Tikhonov, deputy director of the Zoological Institute of the Russian Academy of Sciences. “In terms of its state of preservation, this is the world's most valuable discovery,” he said. The six-month-old female calf was discovered on the Yamal peninsula of Russia and is thought to have died 10,000 years ago. The animal's trunk and eyes are still intact and even some of its fur remains on the body. The 130cm (4ft 3ins) tall, 50kg Siberian specimen dates to the end of the last Ice Age, when the great beasts were vanishing from the planet. Larry Agenbroad, director of the Mammoth Site of Hot Springs research centre in South Dakota, US, points out: "To find a juvenile mammoth in any condition is extremely rare." Despite the inherent challenges, Dr Agenbroad is optimistic about the potential for cloning or “resurrecting” the long gone species. "When we got the Jarkov mammoth [found frozen in Taimyr, Siberia, in 1997], the geneticists told me: 'if you can get us good DNA, we'll have a baby mammoth for you in 22 months'," he told BBC News. The mammoth is an extinct member of the elephant family, which may help with the potential cloning process. According to Hendrick Poinar of McMaster University in Canada, "it's theoretically possible" to bring the creature back to life. "I think it's going to be done at some point. Once you have the genome of a mammoth, you could compare it with the genome of its closest relative, the Asian elephant. Then you could genetically engineer the elephant DNA, point by point, so that it matches the mammoth DNA," he said. "Then, by inserting this modified DNA into an elephant's egg cell, and implanting it in an elephant's womb, you could create a modified elephant that's nearly identical to the original mammoth. Or it could become possible to make entire chromosomes from scratch. I wouldn't be surprised if, in ten years, you'd be able to synthesize chromosome-length DNA," he said. What caused the mammoth's widespread disappearance at the end of the last Ice Age remains a mystery. Possible culprits are climate change or overkill by human hunters, or a combination of both. Mammoths first appeared in the Pliocene Epoch, 4.8 million years ago, but a population of mammoths lived in isolation on Russia's remote Wrangel Island until just 5,000 years ago. Whether the leatherback sea turtles or the mammoth even can be cloned, has yet to be seen. Scientists are hopeful, but even if they can successfully clone the animals—cloning is not a long-term solution to the current widespread extinction crisis. Gawking at a living mammoth would be incredible, don’t get me wrong—but it won’t save the lives of thousands of precious modern day species disappearing due to man-made causes. No, we’ll need some much bigger solutions than cloning if we truly want to preserve the world’s biological heritage.